Before he was the Czar of Russia, overthrown and executed by the Bolsheviks, Nicholas II was Tsesarevich of Russia from 1881 to 1894, while his father Alexander III sat on the throne. At the age of 22, Nicholas was sent on a tour of the empire and neighboring lands, primarily to reach the Pacific port of Vladivostok and preside over the beginning of construction of the Trans-Siberian Railway. On his way there he visited Egypt, India, Thailand and Japan along with his brother Grand Duke George and cousin Prince George of Greece and Denmark. When Nicholas’ ship reached Japan in April 1891, they docked in Nagasaki over Easter Sunday, and the entire crew spent the weekend aboard their ship deep in reflection and prayer. Nicholas was distracted by Japan, noting that the Russian sailors who stayed in Nagasaki had temporary wives and wished for one, regretting that his Eastern Orthodox religion frowned on such a practice. He and Prince George snuck out of the ship and travelled Nagasaki by rickshaw, delighting in what they saw. Nicholas II on a rickshaw in Nagasaki, 1891. Photo was allegedly taken by Nagasaki photographer Ueno Hikoma, but this is unconfirmed. Nicholas had been reading Madame Chrysanthème by Pierre Loti on the way to Nagasaki, and was inspired by the novel to get himself a tattoo. Tattooing had been banned by the Meiji Emperor, but tattoo artists still worked, mostly for curious foreigners like Nicholas. He ended up getting a tattoo of a dragon on his right arm that took the artist seven hours to make. Yale University’s Beinecke library somehow got a hold of some Romanov family albums which include two photos where the tattoo is barely visible (most photos of the Czar show him in long sleeves). The tattoo was also used to identify Nicholas’ remains when he and his family were found and dug up in 1991 (DNA testing confirmed the remains in 2009). The royal party journeyed to Kyoto in May, and on May 11 spent a day at Otsu, on the shores of Lake Biwa. On their way back to Kyoto, Sanzo Tsuda, one of the police officers charged with protecting the future Czar, leaped onto his carriage and tried slashing him with his sword, his swings being blocked by Prince George. He managed to strike one blow against Nicholas, giving him a gash on his forehead (the scar does not appear in any photographs of him, and it’s possible the wound was on the back of his head, covered by his hairline). Nicholas made a quick recovery in Kyoto and the incident was a huge scandal in Japan – the Home Minister and Foreign Minister resigned, accepting responsibility, and the Emperor expressed regret publicly. 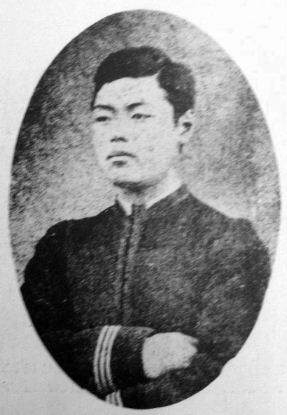 The government tried prosecuting Sanzo Tsuada under Article 116, which guaranteed the death penalty for crimes against the emperor, but the courts decided the law didn’t apply (after all the law was for crimes against the emperor, not visiting royalty), and Tsuada was sentenced to life in prison, where he died of illness in September 1891. Nicholas proceeded to Vladivostok on schedule. He became Czar in 1894 and would keep an interest in Asia, fighting a war (and losing) against Japan in 1904-05. He soon faced trouble at home with the Russian Revolution in 1905 and again at 1917 that drove him from power.